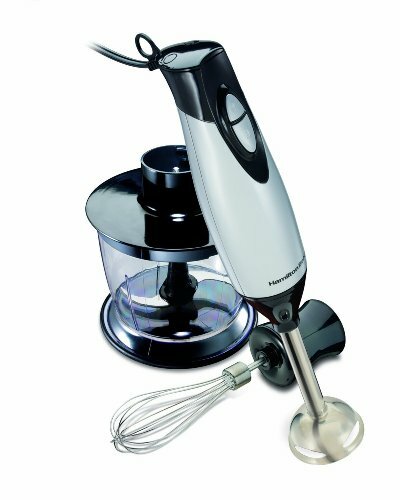 Looking for a hand blender with whisk attachment? These 10 immersion blenders that come with whisks make it easy to blend and whisk without buying multiple pieces of equipment. It’s easy to blend or whisk any ingredients, doughs, or batters in your kitchen, thanks to the 250 Watt motor on this blender. 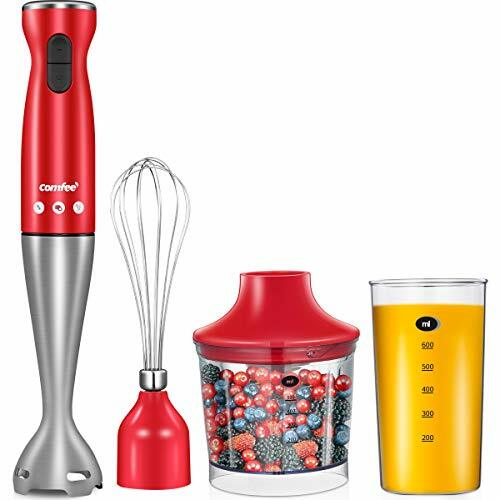 The ergonomic handle ensures that your hand won’t get tired when holding or using this blender, and the appliance is designed so that you can use it in plastic cups, your favorite pot, or even mixing bowls without damaging them. The blending attachment is long enough that you can blend a lot of food at once, and the whisk is safe for use in any bowl and can easily handle any recipe you want to make. You won’t ever experience a hand cramp when using this hand blender, thanks to its ergonomic design and comfortable non-slip grip. Additionally, the motor is made of copper and designed to withstand long periods of use without overheating or breaking. Enjoy switching between the whisk attachment and the blending arm so that you have complete control in the kitchen. Since this blender is backed by a 2-year warranty, you can get the help that you need if you experience a problem. The dishwasher safe attachments on this hand blender make meal prep a breeze. 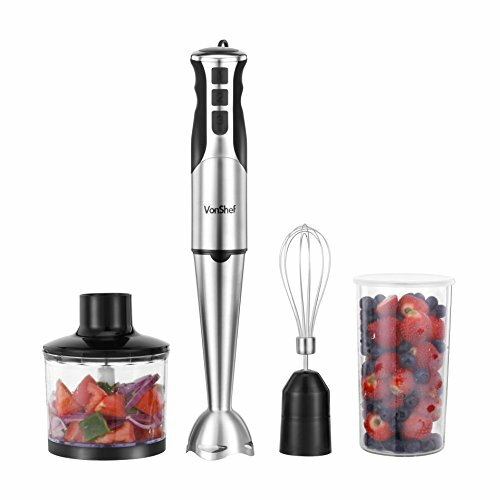 By using the whisk and the blending wand, you can puree, chip, blend, whip, and mix. The included chopping bowl holds 2 cups of ingredients, which is ample room for when you need to prepare items for a meal. This ensures that you have enough space for your prep and that you can easily wash everything, as all attachments and the bowl can be put in the dishwasher when you are done. 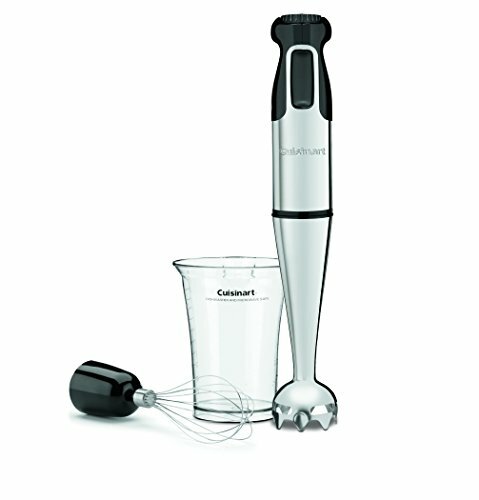 The 200 Watt motor on this Cuisinart hand blender is powerful enough to allow you to whisk and blend most any ingredients in your kitchen. It comes with a mixing beaker that is marked to allow easy measuring when you are in a hurry. Additionally, it’s very easy to switch between the whisk and the blender attachment so that you don’t spend a lot of time trying to change between the two. The variable speed control ensures that you have complete control over what you are making. 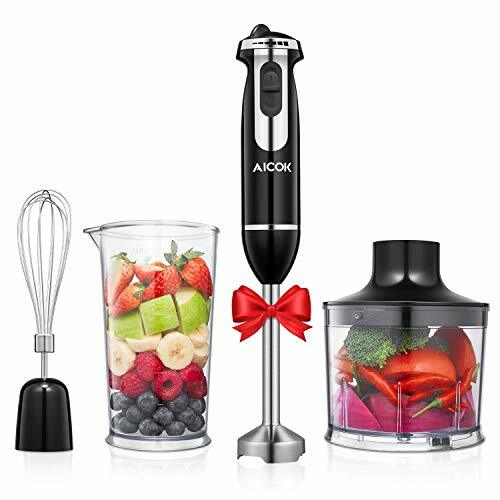 Not only does this hand blender come with a whisk attachment to make whisking and frothing in your kitchen incredibly easy, but it also has three different bell blades to choose from so that you can puree, crush, and blend. The chopper attachment makes chopping herbs and nuts fast and prevents you from accidentally making a mess. You can count on this product to be completely BPA free and to be made of high quality stainless steel. 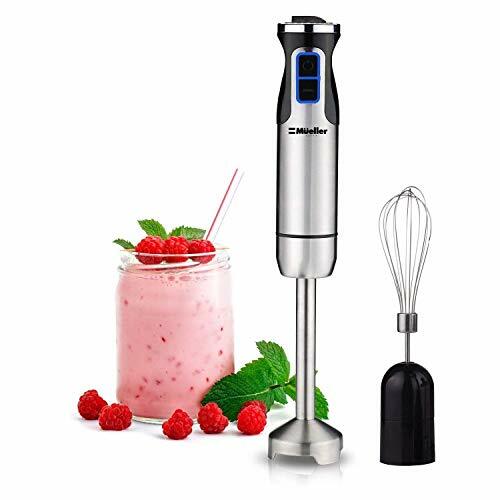 It’s incredibly easy to attach the optional whisk attachment to this hand blender, and, since it has two different speeds to choose from, as well as a blending beaker and chopper bowl, you can perfectly chop and whisk anything in the kitchen quickly. The stainless steel wand is easy to clean and won’t stain, which ensures that your hand blender always looks amazing, no matter how much use it gets. 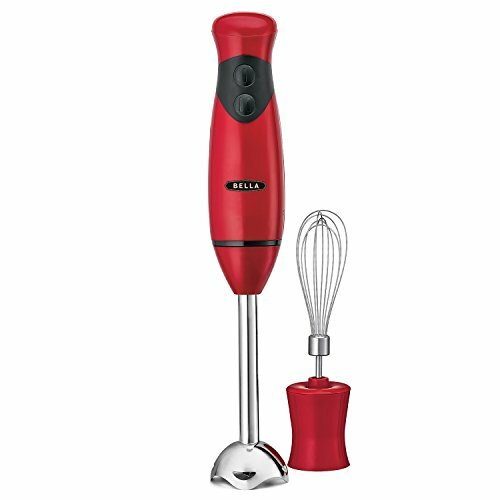 Thanks to the powerful 200 watt motor, you can blend or whisk most anything in the kitchen without problems. 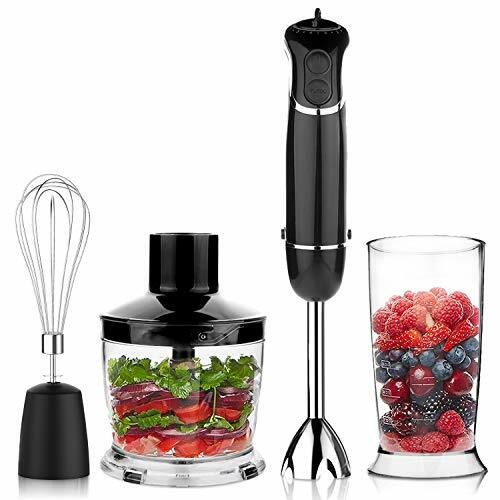 It’s easy to see why this blender with a whisk attachment is so popular, as it boasts not only six different speeds that you can choose from, but also a rubberized handle so that you don’t accidentally lose control of the blender. Additionally, there is a turbo option that will allow you to really speed up the blender or the whisk, which ensures that you have all of the power that you need. You won’t have to use a hand whisk anymore when you have this great hand blender, which means that you can easily do more cooking and baking without making your arms tired. With a 300 Watt motor in this blender, you won’t ever have problems blending or whisking anything in the kitchen. The adjustable speed can be changed between low and high so that you get the right consistency on the food that you’re making. Not only is this blender attractive, thanks to its sleek design, but it’s easy to hold and to use for long periods of time. Make with BPA-free attachments that can be put into the dishwasher, it’s designed to be safe and easy to use. Users are sure to love that there are six different speeds on this blender and that there are two turbo settings for when you need to finish blending or whipping. The turbo boost button is to be used for shorter periods of time, but will help you power through any hard ingredients. 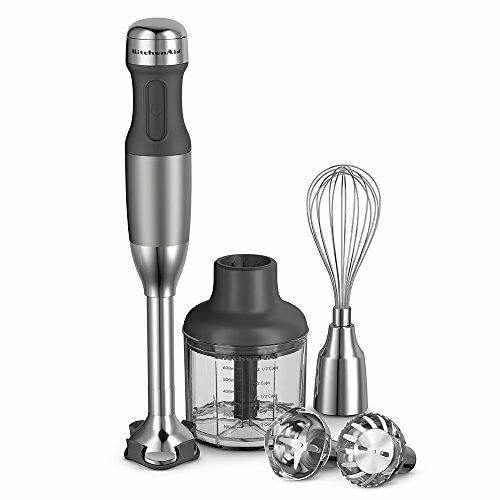 The click action for the whisk and blender attachment helps give you peace of mind that they are connected and makes it easy to remove them when you want to switch them or wash them. With a 3-year warranty and the promise of BPA free materials, you don’t have to worry about the safety of your family or how well your new blender will last. 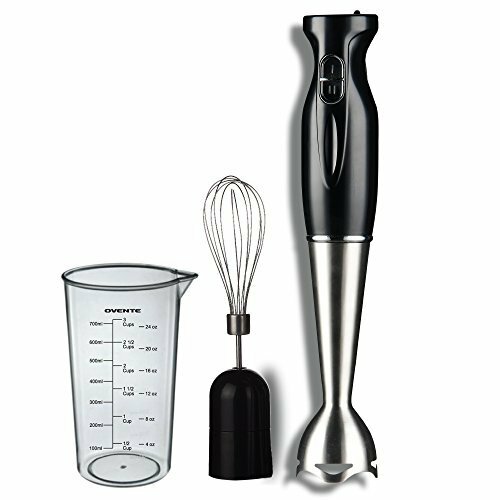 The stainless steel whisk that attaches to this hand blender makes whipping and frothing fast and easy. You won’t ever experience a hand cramp when using this blender, thanks to the ergonomic design, and, because the motor is 400 Watts, you can power through most anything without any problems. There are three speed settings to choose from so that you can make sure that you don’t make a mess, and you can blend, chop, or whisk your ingredients perfectly.